In 2011 Kristian graduated Maastricht University with a master degree in Global Health and wrote his thesis on how to leverage internet and mobile phones to improve volunteer coordination and disaster response in Kenya. He gained work experience in the use of information and communication technology (ICT) in various settings such as health programs, hospitals and (social) enterprises. In 2015, he joined KNCV as a Young Professional and was given the opportunity to develop a broad professional basis in TB control through intensive training in The Hague coupled with an international field assessment of 2,5 months in Bangladesh. 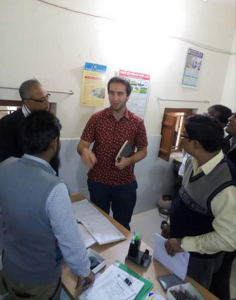 Since his return from Bangladesh, Kristian has been part of the digital health initiative where he and other colleagues have developed a comprehensive, action-oriented digital health strategy for KNCV. This strategy aims to lead to more and better utilization of digital health solutions in countries were KNCV works. He also became part of the New Drugs and Regimen initiative that supports countries in the roll-out of short TB treatment regimens and the introduction of new drugs like delamanid and bedaquiline. For the next year he will support National TB programs in Bangladesh, Malawi, Nepal, Swaziland and Ukraine to assess and implement digital health solutions to improve the accessibility, availability and the exchange of information to empower patients, health providers, managers and policy makers to take well-informed decisions.